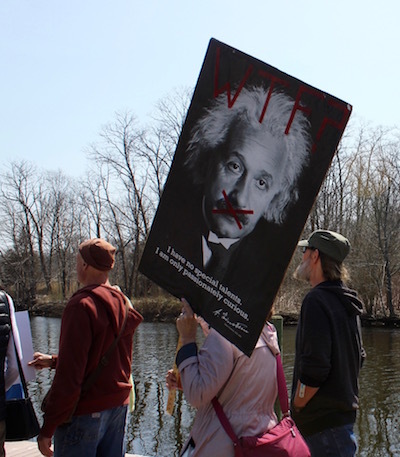 An enthusiastic group of more than 50 unabashed nerds and nature lovers from the North Fork and throughout Long Island converged on downtown Riverhead the balmy morning of April 14 to share their love for all things analytical and real. 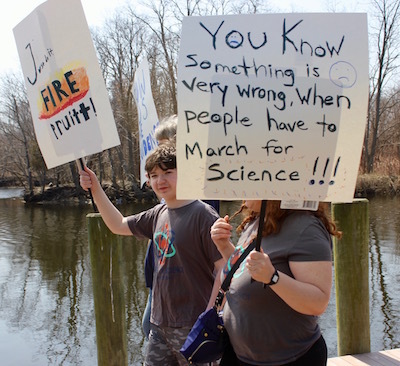 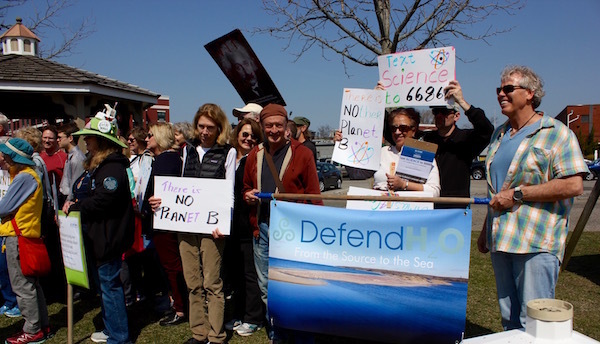 They were all a part of the second annual March for Science, taking place in cities throughout the world, organized here by the North Fork Audubon Society and North Fork Environmental Council. 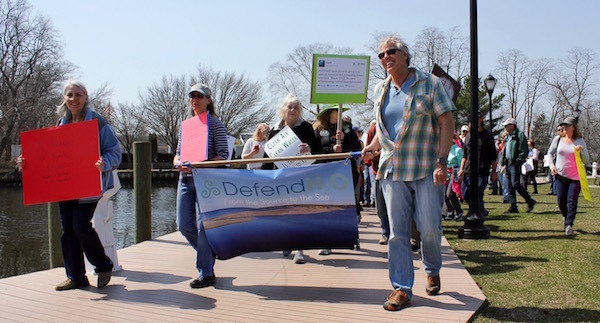 As the group converged near a gazebo alongside the Peconic River behind Main Street, Debbie O’Kane, who serves as the president of North Fork Audubon and the programs director of the NFEC, pointed out that both local organizations were founded 45 years ago — about the same time as the Environmental Protection Agency. 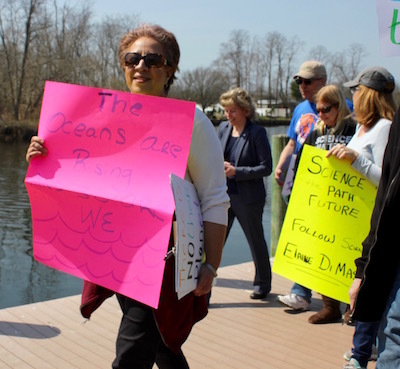 Today, she said, environmental regulation is under threat, before reminding the group how the banning of the pesticide DDT helped lead to the remarkable comeback of Long Island’s native fish hawk, the osprey. 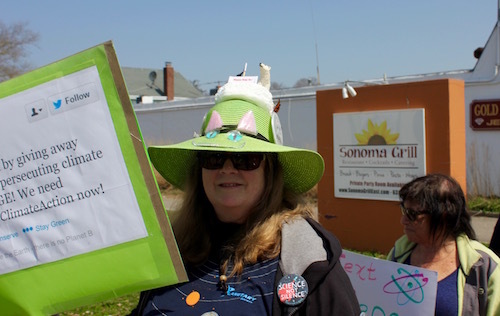 “The osprey would have been gone if we weren’t able to regulate pesticides,” she said. 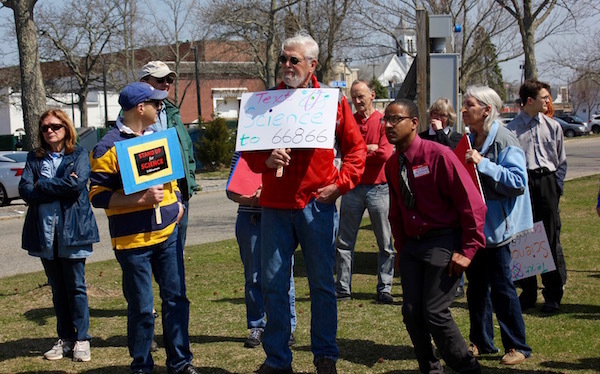 Mark Haubner, a climate science advocate from Aquebogue, urged attendees to commit to give 10 percent of their time to advocating for environmental issues. 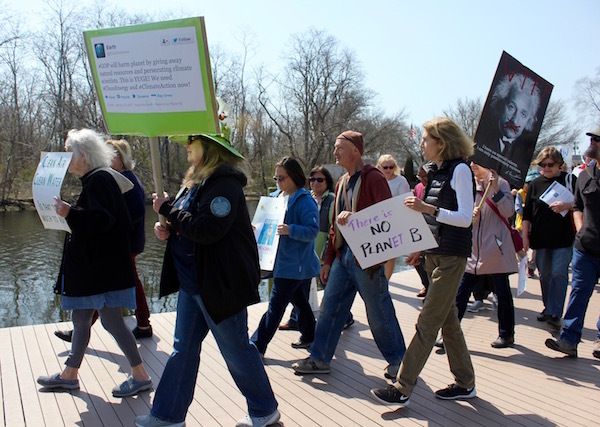 Two Democratic candidates for the First Congressional District, real estate financier Perry Gershon and longtime Brookhaven National Laboratory physicist Elaine DiMasi, also attended the march. 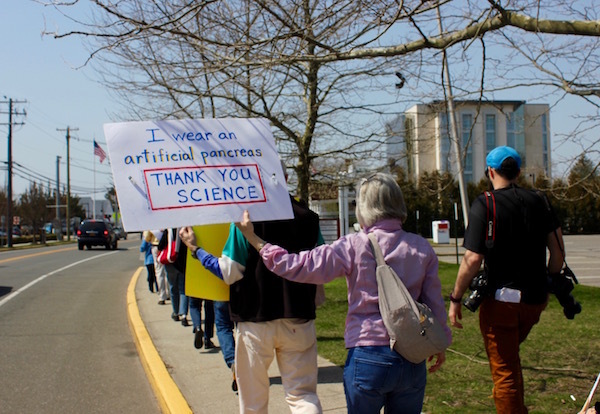 Wielding banners with slogans like “Stand Up for Science,” “Text Science to 66866 to Support Elaine DiMasi,” “There is No Planet B,” “Show Us The Evidence,” “The Good Thing About Science is It’s True, Whether You Believe It or Not,” “I Wear An Artificial Pancreas: Thank You Science,” “Be Pragmatic, Not Dogmatic,” “Just Do It: Fire Pruitt,” “The Oceans Are Rising and So Are We” and “You Know Something is Very Wrong When People Have to March For Science,” the crowd walked east along the riverfront boardwalk, headed uphill to Main Street, then marched east to Riverhead Town Hall and then back downtown to Grangebel Park. 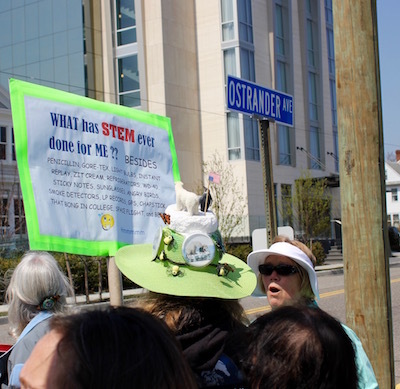 Tara Patin of Sayville marched with a sign elaborating on all the things STEM (Science, Technology, Engineering and Math) have done for her, along with a bright green hat topped with a polar bear. 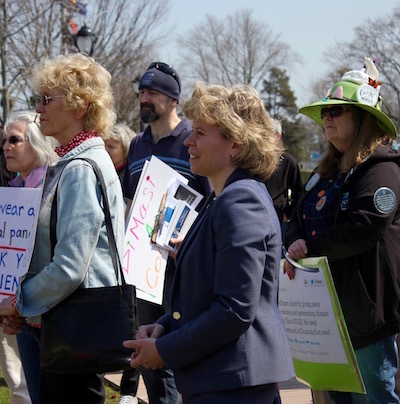 Ms. Patin said she is also concerned about allowing natural resources to be exploited in national parks and attacks on the Endangered Species Act. 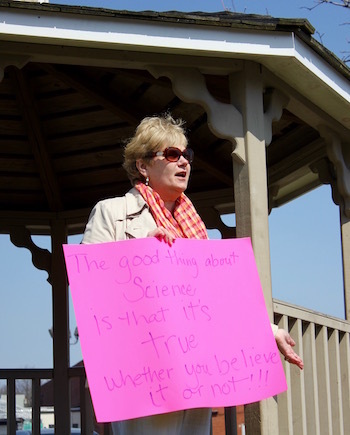 Ms. Patin said she had marched in the April 2017 March for Science in Washington, D.C., where the camaraderie overcame the pouring rain. 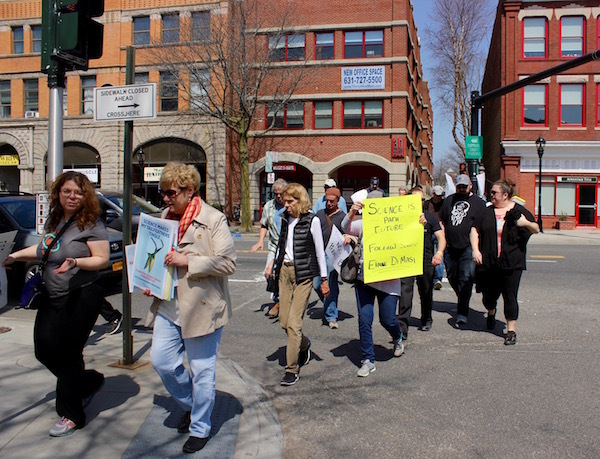 She said marching for causes she believes in has become a habit this year. 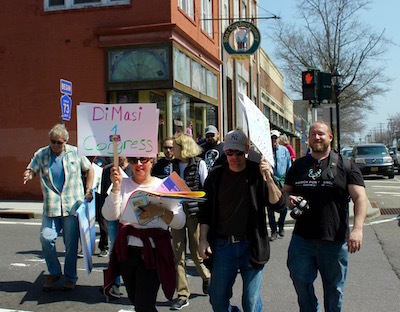 Many of the marchers were supporters of Ms. DiMasi’s campaign. 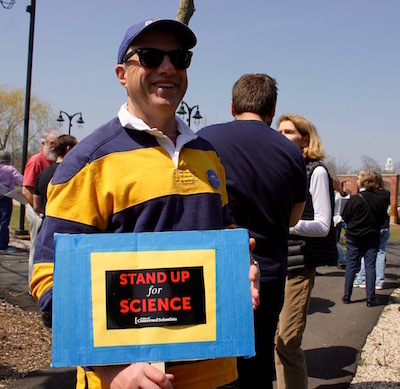 Jon Mocko of Setauket, who works in IT, is a volunteer field captain with Ms. DiMasi’s campaign. 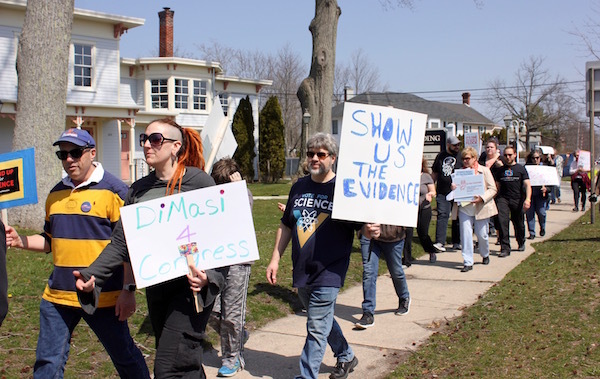 He said he’d never been politically active before, but in political discussions on Facebook, he’d learned about Ms. DiMasi’s campaign and had gone to hear her speak. 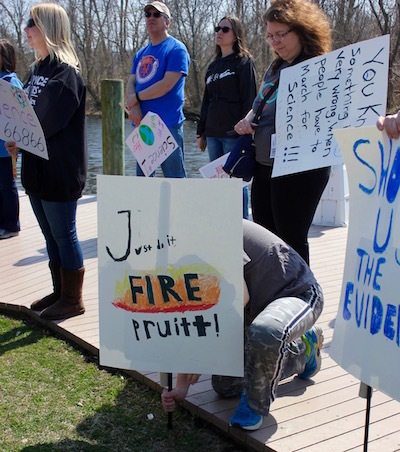 Ms. DiMasi added that regulatory agencies like the EPA can take action to stop environmental dangers based on the facts far more quickly than a chamber full of legislators.